Established in Naples, Italy in 2010 by a young and experienced team of ICT, geophysicist and marine survey engineers, INSTALL is an innovative and avant-garde technical support to the marine offshore survey industry. INSTALL provides marine geophysical and environmental surveys and technical support services worldwide to companies and organisations operating in any marine or aquatic environment. Our reference market includes offshore oil and gas, submarine cables, port and coastal, renewable energies, scientific research, marine technologies and other related businesses. INSTALL offers a wide range of technical, operational and scientific support services in the fields of marine sciences and technologies and marine survey engineering. INSTALL has focused on equipment and application development for the growing IMR market. In recent years, a vast amount of seabed structures and other hardware have been developed and installed offshore, all of which require regular inspection and maintenance. The company has focused its skillsets on offering specialised and cost-contained services. A range of services are provided within this market, including visual soft applications, light construction work, inspection and remotely operated vehicle (ROV) operations. In addition, INSTALL provides vessels to support all of their services. INSTALL offers geophysical survey services from basic bathymetric surveys to fully integrated geoscience solutions. The company is equipped to meet the needs of its clients, deploying innovative technology to provide the most appropriate and cost-effective solutions in the offshore environment. A GIS integrates hardware, software and data for capturing, managing, analysing and displaying all forms of geographically-referenced information. It allows us to view, understand, question, interpret and visualise data in ways that reveal relationships, patterns and trends in the form of maps, globe, reports and charts. Autochart is an AutoCAD extension that automates the production of north-up and alignment sheets for both hydrographic and terrestrial datasets. It helps achieve compressed delivery schedules by creating fully georeferenced multi-paneled charts in a fraction of the time taken by manual drafting techniques. The visual soft suite is modular collection of applications to record, edit, archive, review and report digital video inspection data. It is designed for any type of video inspection where large volumes of video must be recorded from one or more camera and synchronised with other data resources. The suite of products caters for both structure and pipeline inspection with minimal configuration to change modes. The software has been integrated into most industry standard inspection packages (further details are available on request). The key component of video inspection is the initial video encoding, and this has been designed to meet the requirements of all inspection and monitoring tasks. Automation is a key feature of providing automated file management and distribution, relieving the operator of the burden of manually copying large quantities of video files. The visual soft suite is a world leader in subsea digital inspection systems. It has a proven track record in the offshore inspection survey market since 2001, with more than 600 operational systems worldwide. 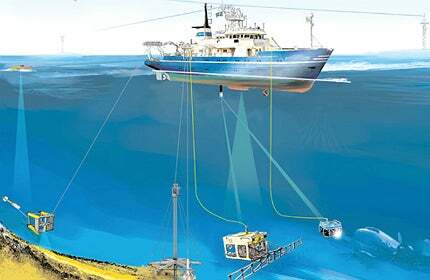 INSTALL provide a complete solution for digital video capture, playback, processing and reporting of pipeline, structural or other inspection survey data for the offshore oil and gas industry. INSTALL offers acoustic metrology services as a complete package from procedure study and editing, engineering and operating and operations offshore. Our team is fully trained in the latest generation of the Sonardyne 6G and will give you complete support in all of your operations. INSTALL’s dam inspection method is based an underwater positioning system that’s specifically optimised for the in-water inspection of vertical structures by ROV. It can inspect dams and other vertical structures accurately with position-quality indicators, rapid set-up and calibration in any location in minutes. It uses any available dam plan, photo or diagram. Painting the dam’s features shows the coverage as inspection progresses and fixes relevant events for further replay or yearly inspections.